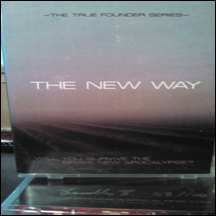 Hand signed and numbered by Bradley Bills, Brave New Apocalypse CD, The New Way booklet and audio cassette. Hand assembled by Bradley Bills. Written and produced by Bradley Bills, with an added assault of mixing by the creator of the Ultra Heavy Beat: Sascha Konietzko (KMFDM) - Brave New Apocalypse showcases CHANT's signature tribal driven sound and slams with heavy melodic lines and classic industrial inspiration. With guest performances from Jules Hodgson (KMFDM/Pig), Patrick McManis (Evil Mothers), Adam Donovan (Seek Irony), Kristopher Robin (Guild) & Alvin Melivin (Melivin; Inc.) - Brave New Apocalypse is CHANT's most driving, hard hitting, dynamic record to date.